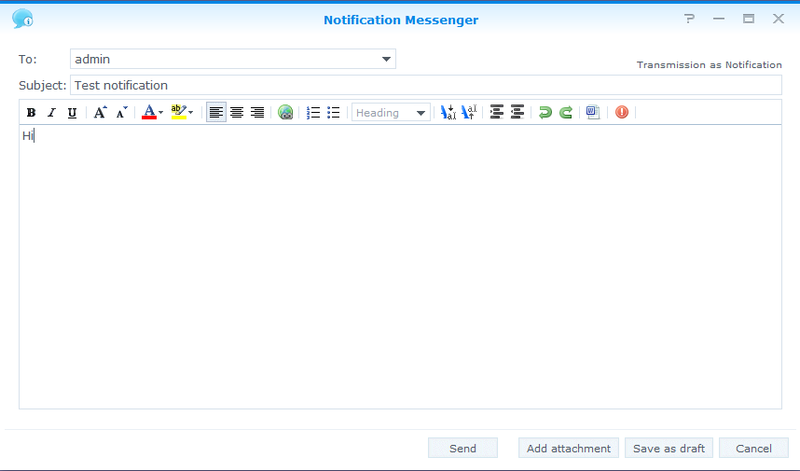 Notification Messenger is an email client like application for the DSM-internal messaging system. 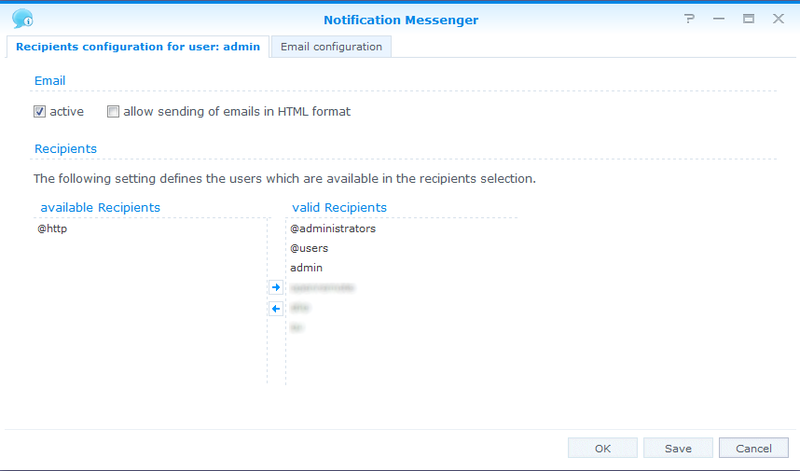 The application is useful for support in multi-user environments and in conjunction with Notification Forwarder to send semi-direct messages to mobile devices. Notifications can be archived or saved for later use as a draft. 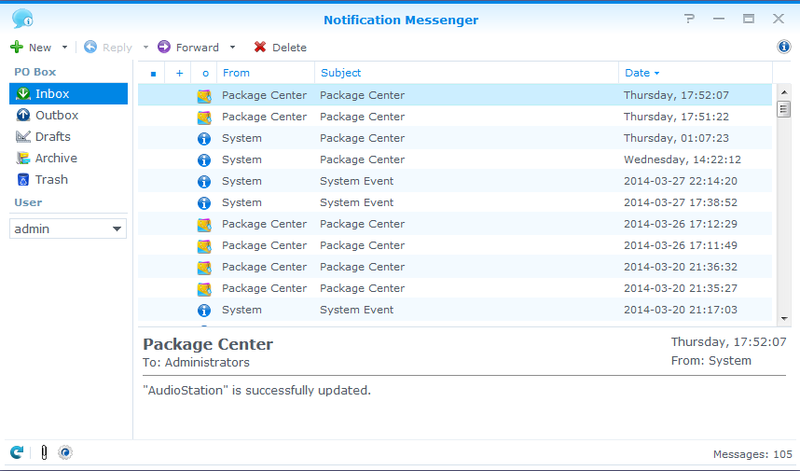 - extend option dialog "valid users"
Hi I get an error when I try and same on the screen to go in to select recipients. I cannot send messages from the messenger but testing from the forwarder looks fine.. It's all working on my old NAS with the earlier versions. Having this same issue of email smtp test failing.. I have tried with DSM 'notification setting' and user defined with gmail smtp and local smtp (another synology).. same error (SMTP connection test fail! Please check the given parameter. --Now the DSM configuration part email config password boxes are greyed out and cant even test that option anymore. Anyone shed any light on this? am using DSM 5.0.. maybe this is the problem? I have added users to the valid recipient list. I experienced the same exact problem. I tried applying Gmail SMTP settings within those options. I honestly cannot figure out what I am doing incorrect. I am experiencing an issue with a completely blank error box popping up when trying to send a message to a defined user. I have sent the developer an email via his contact submission portal on his homepage. I have allso the Problem with the message. When i tipe a Name in the Feld "to" and go to the next once the text i typed in is not anymore there and when i would't like to send it the message: No UserName is in the Feld "to"
@bhotrock: You need to modify your options and add recipients to the recipients configuration. Ok, new problem. When I try to create a new message, or forward an existing notification, I can't enter anything into the TO: field. I can type something there, but when I move to the Subject field, the To field is empty. Click on the dropdown arrow also reveals nothing. I've tried entering a username, a groupname, an email address and nothing will stay in the To field. When I then try to send the message, I receive the error: At least one recipient must be given! Just to follow up. After logging out and logging back in, no more error and the package works. I am also getting the "Sorry the page you are looking for is not found" error. I am running DSM 4.3-3776 on a DS-1511+. I have Perl 5.8.6-0003 installed and running. I have de-selected "Improve protection against cross-site request forgery attacks" in DSM settings, security. Running English language. Any suggestions?